Grease a baking tray with some oil. Put chicken wings in a bowl. Add salt and crushed peppercorns, mix well. 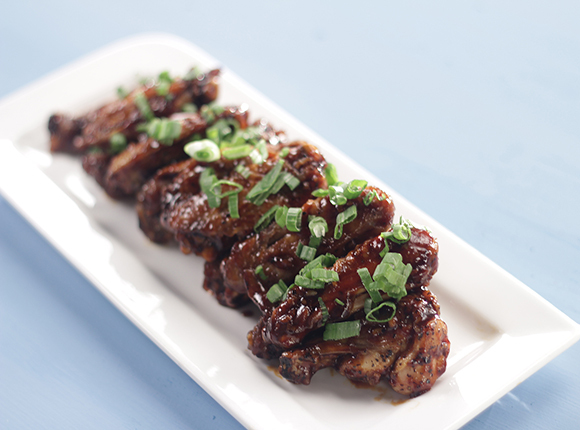 Transfer the chicken wings on the greased tray and set aside for 10-15 minutes. Put the tray in the preheated oven and bake for 40 minutes. Heat sesame oil in a non-stick pan. Add garlic and ginger and sauté till fragrant. Add soy sauce, paprika and ¼ cup water and mix well. Add honey and mix well. Add cornflour slurry, mix well and cook till the sauce thickens. Add chicken wings and mix till all the wings are well coated with the sauce. Add vinegar and mix. Adjust salt, mix and cook for 1-2 minutes.